Zion Market Research has published a new report titled “Construction Fabrics Market by Type (PVC, PTFE, ETFE, and Others), by Application (Tensile Architecture, Awnings & Canopies, and Facades): Global Industry Perspective, Comprehensive Analysis, and Forecast, 2017 – 2024”. 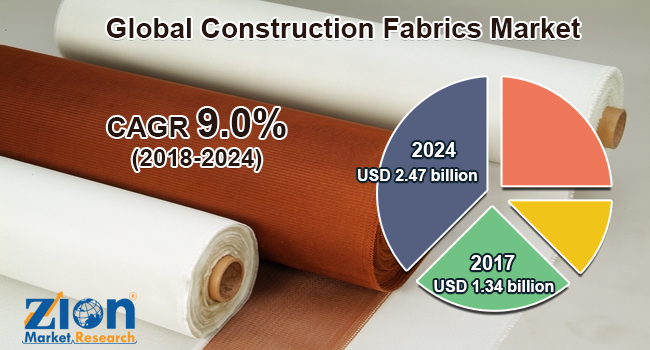 According to the report, global construction fabrics market was valued at approximately USD 1.34 billion in 2017 and is expected to generate revenue of around USD 2.47 billion by the end of 2024, growing at a CAGR of around 9.0% between 2018 and 2024. Growing building and construction activities across the globe are expected to drive the global construction fabrics market growth over the forecast period. The production of architectural fabrics is mostly focused on polyethylene (PE), polyester (PES), and fiberglass. Polytetrafluoroethylene (PTFE) is generally used in the coating layer, and it is available as yarns for applications in sound absorption, lighting, and easy recycling among others. Moreover, growing housing activities indicates the higher level of construction activity resulting in more usage of construction fabrics. As more homes are built, demand for modern and innovative construction materials has also increased which are anticipated to drive construction fabrics market growth over the forecast period. Increasing consumer spending on homes for renovations, home improvements, and remodeling is expected to positively drive the construction fabrics market growth in the forecast period. The Construction sector and construction activities are considered to be one of the major sources of development, growth, and economic activities. It is the construction industry and the engineering services industry that play an important role in the economic uplift and development. Such factors would further drive the global construction fabrics market growth over the forecast timeframe. Based on the type, the construction fabrics market is segmented into polyvinyl chloride (PVC), polytetrafluoroethylene (PTFE), ethylene tetrafluoroethylene (ETFE) and others. The ethylene tetrafluoroethylene (ETFE) segment accounted for the highest revenue share in 2017. Ethylene tetrafluoroethylene (ETFE) is the polymer which is used in building textiles due to its excellent radiation, high melting temperature, and electrical and chemical resistance properties. Such factors are expected to drive the segment growth in the near future. Based on the application, the construction fabrics market has been segmented as awnings & canopies, tensile architecture, and facades. The tensile architecture is expected to dominate the application segment over the forecast timeframe. The tensile architecture provides ease of pre-fabrication, covers large widths, and offers flexibility. They work on the principle of tensile stress. The unique features of tensile materials include flexibility and durability along with its ability to provide virtually unlimited designs in the construction of modern structures. Tensile structures are beneficial for numerous large-scale structures which include large roofs, such as viewing arena, stadium, sports hall, public spaces, and others. Such factors are expected to drive tensile architecture application segment growth in the coming years. Europe, Latin America, North America, the Middle East & Africa, and the Asia Pacific are regional segments of the global construction fabrics market. Europe held a major revenue share in 2017 and is likely to dominate the market share during the forecast timeline. The growth of the market is attributed to the increasing demand for modern and innovative construction materials along with the presence of major players in the region. The Asia Pacific is projected to grow at the highest growth rate over the forecast period. The growth is attributed to the growing construction activities in countries such as China and India. Some of the key players operating in construction fabrics market include Taiyo Kogyo Corporation, Low & Bonar, Sattler AG, Sioen Industries NV, Hightex GmbH, Serge Ferrari, Saint-Gobain, Endutex Coated Technical Textiles, Hiraoka & Co. Ltd., VERSEIDAG-INDUTEX GmbH, and others.